Angela Constance MSP met with residents and staff of Hanover Court in Livingston as part of a tour to view upgrades to homes at the development. Residents, including Mrs Emmie Brown and Mrs Elizabeth King, welcomed Ms Constance into their homes to show her the upgrades and share their experiences of the improvements. This included new highly efficient gas central heating combination boilers that were installed in October 2017, replacing electric storage heating systems. During her visit, Ms Constance heard that the new heating systems are easier for residents to use when controlling the level of heat in their homes and have saved them money despite “the long, cold winter this year”. Following the installation of the gas central heating systems, new modern kitchens were also fitted in all homes with residents having an individual choice of styles and colours for their cupboards and worktops. 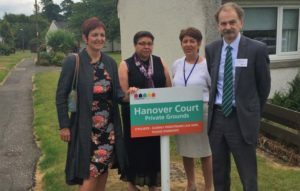 Hanover Court in Livingston Village is made up of 20 bungalows around a grassed garden area which staff and residents say creates “a sense of community”. During Ms Constance’s visit, development manager Janet Meier shared details of the variety of the social activities organised at the development including day trips to destinations such as Millport and monthly coffee mornings which residents take turns to host in their homes.